So what have the main contenders shown us this year that reporters are immersing themselves in now, and that we’ll be immersing ourselves in later in the coming months? In this blog entry, I’ve decided to outline the key points from the three main press conferences (Microsoft, Sony, and Nintendo) that have stuck in my mind. Microsoft spent a vast amount of their press conference focussing on the Kinect – an add-on for the Xbox 360 that tracks the user’s full body motion, allowing them to be the controller in various games. Kinect has been out for a few months now and, the way Microsoft are pushing it at E3, it’ll be around for the foreseeable future as well. Microsoft revealed a heap of new and innovative ways that the user can interact with their console, released to the public in the form of Funlabs. Funlabs is an option in the Xbox dashboard that leads the user to a variety of tech-demos utilising the Kinect hardware in unique and exciting ways. The two demos that stood out for me were Kinect Me and Kinect Sparklers. Kinect Me allows you to take a photo of yourself (close up and far away) and convert yourself into an Xbox avatar right before your eyes. It’s pretty impressive but, when they demonstrated it on the stage, the face on the avatar looked pretty freaky!! It looked like the woman who demonstrated it but… I dunno… too weird… but it was certainly a well thought application for face and clothing recognition. Kinect Sparklers was far more impressive. It takes two photographs (foreground and background) and then lets you draw a string of electrified sparks around the screen. Because the Kinect can sense depth, it’s very easy to make the string of sparks go in-front and behind the foreground, giving the illusion that the sparks are wrapping around whomever – or whatever – is in the foreground. You can even view the picture at different angles, to further provide an illusion of 3D. All of this was achieved using Finger Tracking, the main feature of this demo that allows Kinect to detect individual digits on your hands. There aren’t many tech-demos on Funlabs at the moment, but that will soon change I imagine. I believe this is Microsoft’s way of beta testing Kinect-enabled features that they’ve come up with, to see what the public think of them. They’ll probably incorporate some of these features into future games, if the demos have been downloaded enough times. Cheaper than paying expensive beta testers, I suppose. Microsoft also showed off their voice search function, which uses Microsoft’s Bing search engine. All you have to do is say what you want to search for, and your Xbox will comply (e.g. “xbox, bing, harry potter”). Although this isn’t that spectacular, it’s nice to see we’re one step closer to the type of voice interaction we see in Star Trek. The last thing that’s stuck in my mind after watching Microsoft’s press conference was Tom Clancy’s Ghost Recon: Future Soldier. The graphics and sound were impressive, but what caught my eye was the way in which you can customise and use your weapons. Bring a gun up on the screen, take your hands apart, and the gun explodes to reveal its individual components. You can replace any of these components using your voice, and further explore the gun by manipulating it with your hands. You could even tell the game to make a gun best suited for close combat or long range, or even just make a completely random one. When it came to testing the weapon, you would use it with two clenched fists. Aim with one hand and, to fire, you would make an open palm with your other. Clench your fist again and you stop firing. All this, I thought, was very impressive and a great way of showing how you yourself can be the controller. Tom Clancy’s Ghost Recon: Future Soldier, as shown at E3 2011. Besides a demo of the new Lara Croft game and something to do with Sesame Street, I don’t recall anything else from the rest of the conference. It was clear to me that Microsoft see Kinect as the future, and they’ve demonstrated a few really good applications for it at the expo. However, we will have to wait and see how these are included in the next wave of Xbox 360 titles to truly see the potential of them. I wasn’t able to view Sony’s press conference live, because they held it at the end of the first day. That’s 01:30 GMT the next day, for me, so of course I was asleep by then. However, I managed to catch up on the conference later the next day, and I wasn’t at all surprised at how they opened: with discussing the PlayStation Network outage. They apologised for the trouble caused and commend their consumers and 3rd party publishers for sticking by them through those terrible times. The PlayStation Network is up and running again now, and Sony have already provided consumers with some free games as a result. So… on with the conference… and the biggest part of Sony’s conference that I recall is PSVita (aka the NGP), Sony’s next generation PlayStationPortable. It has a lot of neat features on it, including a 5″ multi-touch OLED display, a large multi-touch pad on the rear of the device, Sixaxis accelerometers, two dualshock-style analogue sticks, front and rear cameras, and 3G connectivity. It certainly casts a rather large shadow on my already ageing 1000-series PSP. The features were shown off on a couple of games, the most impressive of which were Uncharted: Golden Abyss and ModNation Racers. Uncharted: Golden Abyss looked simply beautiful on the PSVita’s OLED display. The graphics looked somewhere between the PS2 and PS3! The water effects were a nice touch, and the controls seemed intuitive. For example, when climbing along a ledge, you can use the touch screen to simply draw the path you want to take, which would make tricky parts of a game such as that a little easier on the small screen. ModNation Racers further showed off the capabilities of the PSVita, by allowing you to easily create your own tracks in mere moments. A unique use of both the front touch screen and the rear touchpad to plot the track and change the terrain was a stroke of genius. Ruin deserves a mention as well, as it includes cloud game saving which allows it to share game saves with the PS3 version of the game. Play so far through a level on your PS3, save it, and then continue it on your PSVita while you’re away from the house. When you get back home, you can pick up from where you left off on your PS3 again. This is a very good idea, but I don’t know if it was using PlayStation Plus in order to do this. The PSVita is going on sale later this year starting from $249, which means it’ll no doubt be £250 when it gets over here. I’m not sure if I would want to part with that much cash, especially when the 3G/Wifi model is another $50 on top (read £50 for us Brits). Sony also showed off a few new games while they were at it. The one that cought my eye was InFamous 2, a game about a man who has developed special electrical powers, trying to save mankind. I wasn’t aware of the existence of the InFamous franchise until Sony offered it as a free download. Since I got it, I’ve been absolutely addicted to it! The second one shown off today looks extremely impressive, and I for one would like to get hold of a copy some day. 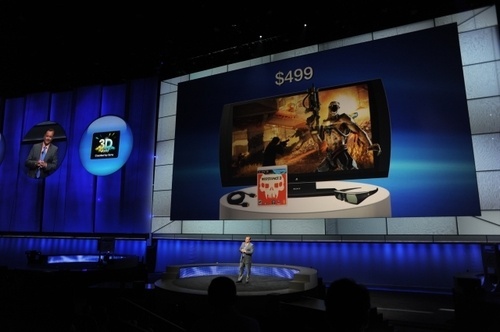 Sony detailing it’s PlayStation 3DTV bundle at E3 2011. Resistance 3 also proved to be rather impressive. Sony used it as an example of how they’ve progressing further into 3D gaming. They spent a fair amount of time focussing on 3D as they see it to be the future of home entertainment. I would agree with this, but 3D televisions are too expensive and additional glasses are also very costly, so at the moment 3DTV is somewhat out of a lot of people’s price range. Sony have noticed this as well, and have revealed a PlayStation-branded 24” 3DTV that they’ll be releasing later this year. It’s a bundle that includes the TV, a 6 metre HDMI cable, a set of 3D glasses, and Resistance 3, all at $499. Sadly this didn’t impress me. Any core gamer would want a larger screen than 24” and I would rather wait until 3DTV becomes more mainstream before thinking of getting such a TV. In fact, it’s been proven that 3D is possible without glasses, so I would certainly wait until they start coming out. Sony started their press conference on a low note, but they’re showing us they’re still focusing towards the future. Whether consumers can afford any of this or not is another matter. Nintendo opened up their press conference with Zelda’s 25th Anniversary. A compilation video of various Zelda games throughout the years was shown on the big screen, along with a symphony orchestra just in front of the stage playing various Zelda themes in time with the video. It was nice to hear all the different theme tunes played live, and shortly after they were finished, Shigeru Miyamoto was on the stage talking about what they had planned to celebrate this momentous occasion. Nintendo’s Zelda Overture introduction at E3 2011. The highlight of the conference was most certainly the announcement of Nintendo’s next generation HD console – Wii U. They didn’t reveal any details of the console itself, but from the preview videos it seems to look similar to the current Wii. Instead, Nintendo focused heavily on its controller, which is a beast in its own right! It has a built-in 6.2” touchscreen display (the controller measures 8” overall), dual analogue sticks, built-in microphone and camera, and built-in accelerometers, amongst other features. Nintendo Wii U console and controller. Once feature that stood out was the ability to use the controller to play the game you’re playing on the Wii U without using a TV, which is handy if someone else has nicked the TV, or if you want to play your game in another room or while laid in bed. This is something that I expected to be able to do with Remote Play on my PSP and PS3, but was sorely disappointed to find I was limited only to the XMB. You can even play games exclusively on the controller itself, and it also provides a 2nd display in the same way the 2nd screen often works on a Nintendo DS, to display maps or inventory. This means there’s less on the TV to get in the way of your playing. I’m eager to learn more about the Wii U… except the price, which I’m sure is going to be high! The next memorable part of the conference was the dizzying array of 3DS games that are on the horizon: Super Mario, Starfox 64 3D, and Kid Icarus Uprising, to name but a few. Nintendo are really pushing the 3D aspect of their latest portable gaming system, just as Sony are pushing 3D for their PS3. An update is being released for the 3DS which makes the new Nintendo eShop available. The eShop is the 3DS’s equivalent to the DSi’s DSi Shop, but it provides a large variety of downloadable content, including: original 3DS games, 3D Classics (classic games remastered in 3D), GameBoy and GameBoy Color games, trailers, screenshots and videos. To commemorate the launch of the eShop, Nintendo are making the 3D Classic Excitebike a free download until 7th July. Although this is all good news for 3DS owners, Nintendo mentioned nothing for their existing DS fan base over 146 million strong. I think only providing a game for DSi owners that may not even have online play (I’m referring to Zelda Four Swords) is a bit of a let down.